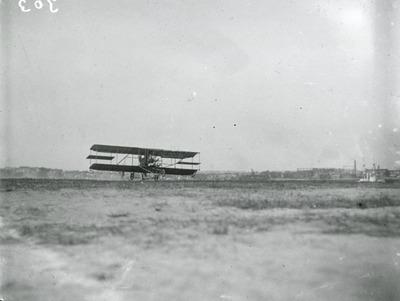 The photograph is of a Burgess-Wright biplane taking off at the Harvard-Boston Aero Meet which was held in Atlantic, Massachusetts from August 26 through September 4, 1911 and was sponsored by the Harvard Aeronautical Society and the Boston Daily Globe. It is believed that the pilot is George H. Mannor and his identification number for the meet was twelve. On the far right side of the image is the battleship that was used for the bomb dropping event during the meet where the pilots would fly over the plaster battleship and drop an object to see if they could hit the model. The image is the same as item number ms338_02_02 which is in the form of a glass plate negative. The number 303 is written on the negative.